We have certainly experienced Buoyancy knowingly or unknowingly. In this topic we will discuss it with examples and get its definition and related equations. We also discuss the contribution of Archimedes in this regard. When we try to place a mug in a bucket of water we feel one opposing force coming upwards from water as we push the mug inside the water. Similarly when we place a rubber ball in a bucket of water we find the ball to float. We also see that a large part of the ball is above the surface of the water, and the rest of the ball is inside the water. Now if we push that rubber ball downwards, a larger part of the ball goes inside the water. But as we remove the force we are exerting, the ball comes upwards and float again. That means to keep the ball inside the water at rest, we have to maintain a downwards force on it continuously. To take the ball deeper, we have to exert more force until a large enough force downward on the ball gets it completely immersed. We will now discuss in details about buoyancy. 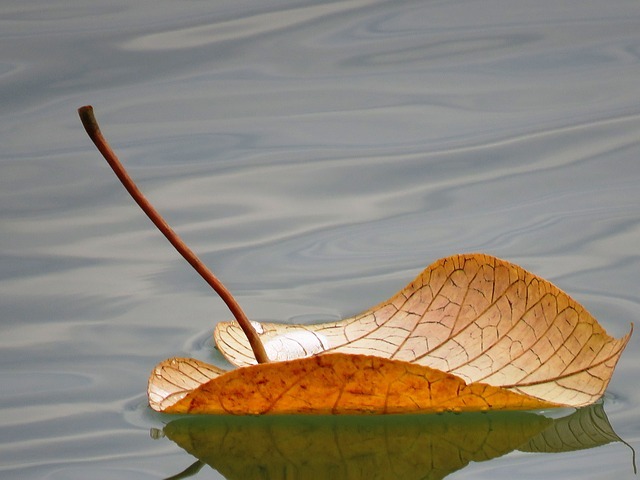 What is buoyancy? The examples discussed above show that when an object is partially or completely immersed in a fluid, the fluid exerts a net upwards force on it. This force is referred to as buoyant force and this phenomenon is known as buoyancy. Now what is the magnitude of this force? We will find it now. 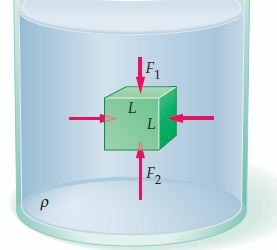 To understand this let’s consider a cubical block immersed in a fluid of density ρ as in Figure 1. The surrounding fluid applies normal forces on all of its faces. Here we are assuming that you are aware of these 2 equations. 2) Pressure at a certain depth h inside a fluid of density ρ is equal to Atmospheric pressure + fluid pressure at that point= P(atm) + h ρ g. [ g is the acceleration due to gravity]. Coming back to the diagram, obviously, the horizontal forces pushing to the right and to the left faces of the block are equal (and opposite as well), hence they cancel each other and have no effect on the block. But this is not similar for the vertical forces. Note that the upward force exerted on the lower face is more than the downward force exerted on the upper face. Why? The pressure at the lower face is greater than that at the upper face as Pressure is directly proportional to the depth here (See the equation 2 above) and lower face is deeper than the upper one. Also you know from equation 1 that Force is directly proportional to pressure. Hence upward force on the lower face is more than the downward force at the upper face. This difference in forces gives rise to a net upward force—the buoyant force. Let’s calculate the buoyant force acting on the block. First, we assume that the cubical block is of length L on a side. Note that we have used the fact that the area(A) of a square face of side L is L^2. Let’s consider the bottom face. The bottom face is at a higher depth than the upper face. And the difference of depth = side of the block=L. Now see the expression or equation of buoyant force. It’s ρ g L^3. As we know mass = volume * density, so ρ * L^3 is the mass of the displaced fluid. And as we know weight = mass * g, so ρ L^3 *g is the weight of the displaced fluid. This means Buoyancy causes an upward buoyant force which is equal to the weight of the displaced fluid. This is a special case of Archimedes’ principle: An object completely immersed in a fluid experiences an upward buoyant force equal in magnitude to the weight of fluid displaced by the object.